Why do we have Automatic Weather Stations (AWS's) and what is on an AWS? Long terms monitoring of climate, e.g. some of the Antarctic AWS's have been in place for over 30 years. 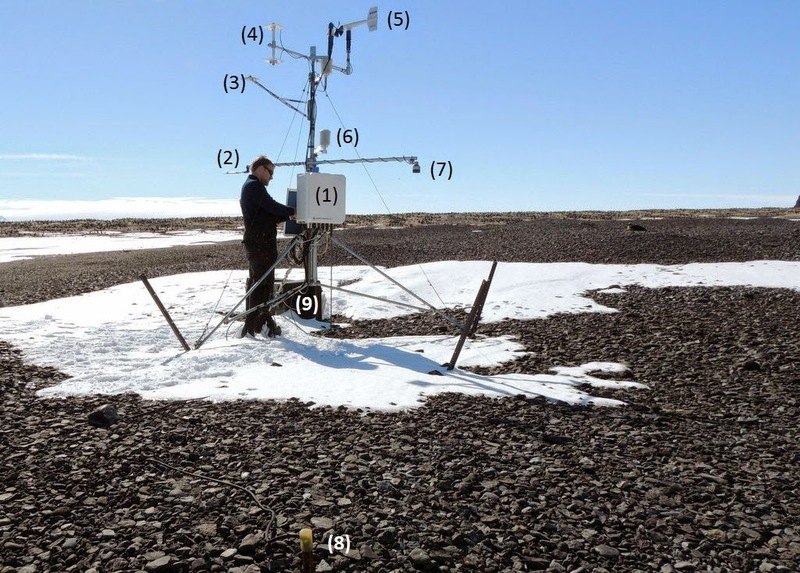 Have regions of Antarctica been warming, cooling or staying the same? Without AWS data we could not answer these questions and would not understand what is happening on our planet. AWS data that is transmitted in real-time is used as input to weather forecast models. If the computer models used to forecast weather have better knowledge of the atmosphere-ocean-land-sea ice system, the more likely it is that their future predictions will produce better results. AWS data can also be used for verifying previous forecasts so that we can assess how accurate our prediction have been. Knowing the atmospheric conditions at a given time and location can help us understand how larger scale geophysical systems work together, for example, how far inland will a warm front move, or how much snow accumulates at the coast and might this impact penguin nesting? An AWS can be mounted with different instruments depending upon the intended purpose of the station. Below I list some of the more common items seen on an AWS. Data logger box. At this station a solar panel is mounted behind the box. This is a net radiometer. It measures to total of solar (or shortwave) radiation and longwave radiation both up and down. Solar radiation is from the sun - the sun is very hot, around 4000C or 7200F, so it emits radiation at short wavelengths. The Earth radiates at a much lower temperature, e.g. -70C (-94F) to 45C (113F), so the radiation it emits is of a longer wavelength i.e. Longwave Radiation. A set of upward and downward looking pyranometers. These measure solar radiation. The ratio of upward to downward radiation is called albedo and it tells us how much solar energy was absorbed by the surface. Snow reflects the majority of solar radiation, so it has a high albedo, while dark rock or soil have low albedo. A pyranometer from a different company (with a US quarter dollar coin on the bench). #6 - Radiation shield for the air temperature and humidity probes. This shield keeps the probes in the shade but allows for an easy flow of air, thus we can get a measurement of the air without instruments being influenced by solar radiation. A US quarter dollar coin is sitting on the bench. An air temperature and humidity probe (with yellow protective cap still on). This is what is inside the radiation shield. #7 - A sonic snow depth sensor. A sonic beam is sent from the bottom of the instrument (the mesh area) and the time for it hit the ground and return indicate how far away the surface is. If snow falls, the surface moves upwards, closer to the sensor, so the beam takes less time to return to the sensor. A set of batteries in an insulated and waterproof case (once the lid is closed). 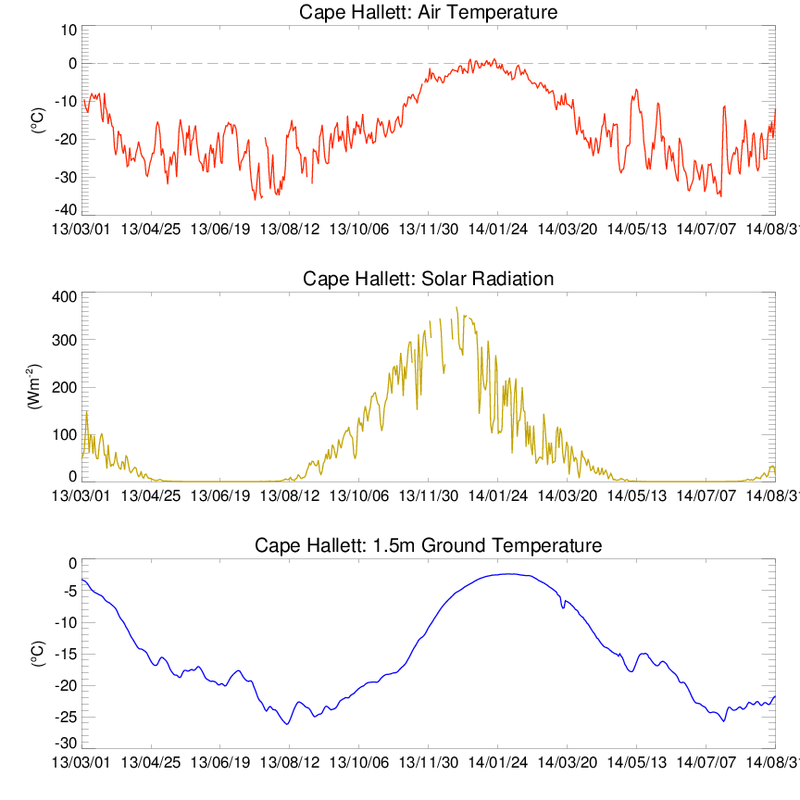 We downloaded data from the Cape Hallett station the other day, so we'll have a quick look at it. 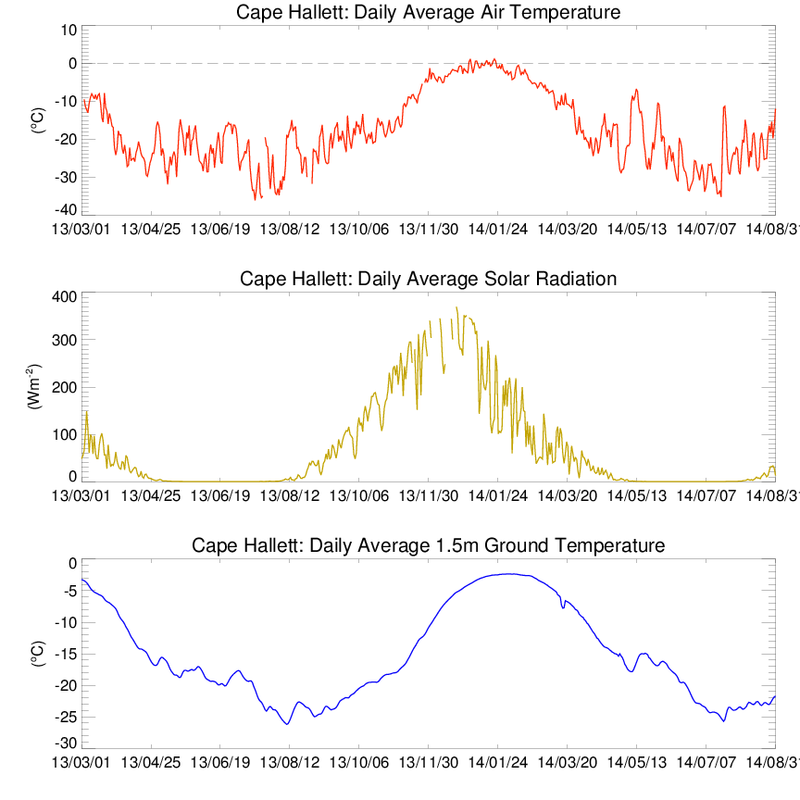 Three variables - daily average of air temperature, solar radiation and ground temperature - have been plotted for the period March 2013 to the end of August 2014. Some interesting features can be seen e.g. Maximum air temperature is a little bit later than the solstice (early January), and air temperature only creeps above freezing (0C, 32F) on a few occasions. Maximum ground temperature at 1.5m depth is in February because it takes extra time for the summer heat to diffuse through the ground to this depth. The temperature does not go above freezing, so this ground is probably permafrost (we need 2 years of data to confirm that diagnosis)!